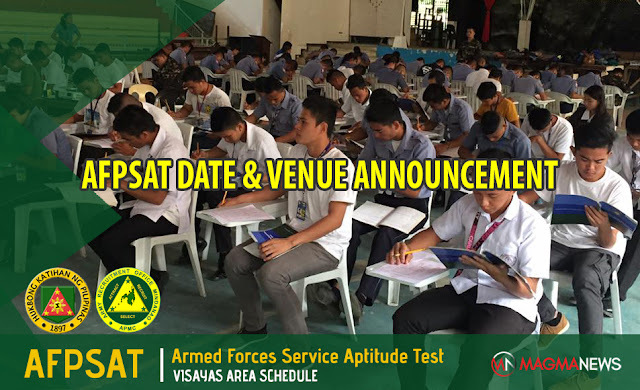 AFPSAT Schedule CY 2019 | Visayas Area - Exam News, Reviewer, Military Career, & Everything [MN] . .
Searching for AFPSAT schedule announcement in Luzon area? Well, you come to the right place! This blog post is intended for updates about on-going and upcoming AFPSAT schedule for Army aspirants in Visayas. Indicated below are the dates and venue of the Armed Forces of the Philippines Service Aptitude Test (AFPSAT) with a guide on how to process the application online. Register online at www.jointhearmy.ph and www.afpsat.afp.mil.ph FOR EXAM PERMIT. Download the following Documents for initial validation.